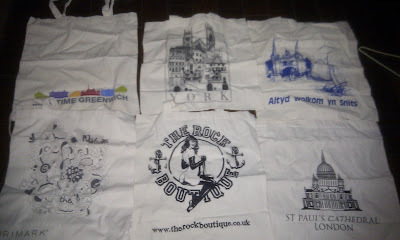 These are another 6 of the cotton shopping bags I bought in the UK (another 6 is here). Each of them reminds me of unique memory of different places. The upper left is the souvenir from Greenwich, where one can stand one feet on the east half of the globe and another on the west. A very popular tourist spot. You have to queue to take photos in front of the silver line of longitude 0 degree. 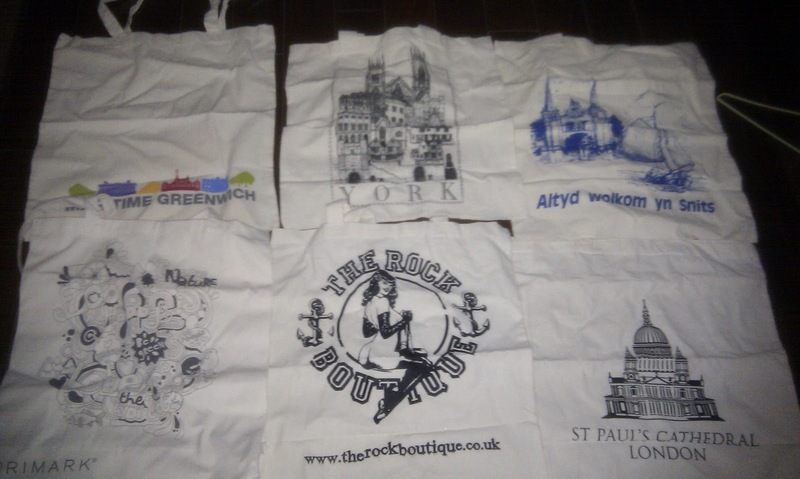 The upper middle, apparently, is from York, one of my favourite cities in the world. I can always recall some of the details of the travel and the memories of York remains vivid because I travel alone. That was the first two days of the one week trip to York and Edinburgh, therefore I'm so energetic that I got a 'passport of York' (or name of this sort) and had a great plan to thoroughly go through every spot it mentioned. And I did! And I took hundreds of amazing photos of the beautiful scenery and historical buildings. I guess the consequence is that the rest 5 days in Edinburgh is not as fun... because of my physical inept. The upper right and the lower middle are from Camden town. Its market is one of my favourite in London. I love its secondhand shops, the river and the live music pubs and everything. Camden town is a subculture of the London life, especially the punk culture. One can see punk hanging around once you hit the town. They're part of the view, an essential part of the Camden town, coexisting so harmlessly and harmoniously with the local supermarket and banks. Indeed like many other tourists' must-visit, it has bars and pubs and sells stuffs similar to other markets, yet it has a unique aroma that turns you a little bit rebel but still, it reminds you a long history of the past through everything around you, starting from the grandpa's trenchcoat and granny's 20s dress in the secondhand stores. The lower left comes from Primark, a department store aiming to sell goods of fine quality and with cheap price. When I say 'CHEAP', it is real low price, not just for the Londoners but for many other cities as well. They have all kinds of items from ear rings to clothes, from beddings to furnitures, everything! And the price is incredibly low such as necklace for one pound and bath robe for 8 pound! It is no wander Primark has become a phenomena of globalsing fashion culture and the popularising cheesy 'Made in Chinese' goods. Everyone loves it! The last one is from the renowned St. Paul Cathedral. Like every other London's must-visits, St. Paul has its own souvenir store. I bought it while I was waiting for a friend and her sister touring inside the grand cathedral. I was eager to finish Dan Brown's The Da Vinci Code and it just comes to final few scenes in St. Paul. How interesting that I'm sitting in the basement of St. Paul and reading fictions featuring the ancient legends right here in St. Paul!